I keep a small, lined Moleskine journal with me at all times. In college I would carry one between the pages of my sketchbook, and in between drawing buildings and taking notes on lectures I would write out my ideas and daydreams and disconnected thoughts. 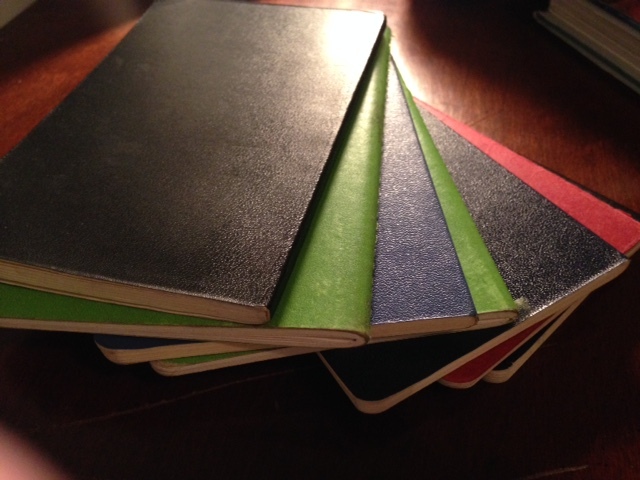 My Moleskines are private, just for me to look at—which helps me to be free in writing what’s really on my mind. I don’t have to worry about writing well because no one else will see it; I can just write, in whatever style makes me happy. The pages of my past Moleskines are filled with some really terrible writing, mixed in with a few lovely sentences here and there—and it’s worth all the junk for the few nuggets of inspiration and moments of clarity I’m able to mine from all my journaling. It’s also nice to have a record of my past self, of how my perspective of the world has shifted over time. I can reconnect with past experiences. My Moleskines give an honest representation of who I have been at different stages of my life; they chronicle all my dreams and delusions, and it is helpful to remember both the good and the bad. They also have helped me to find my own voice—sometimes I think best on paper.